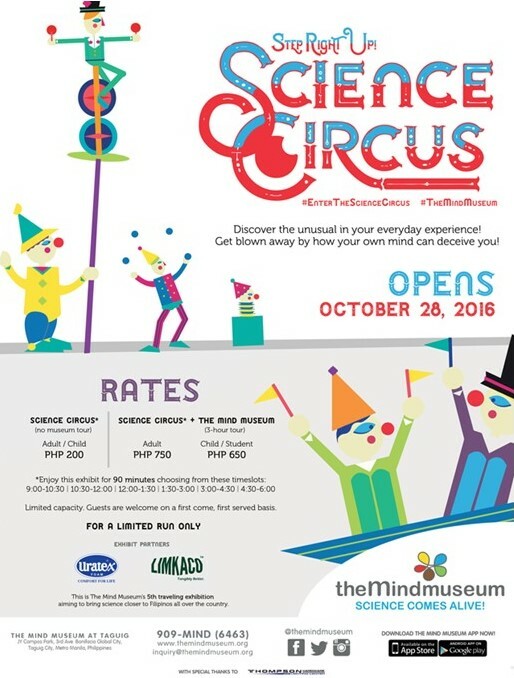 MOMI INVITES/ The Mind Museum’s Science Circus is in Town! My three boys love Science and all its form. At first, I thought their interest on how certain things behave was a mere curiosity. After all, children are naturally inquisitive. That penchant for learning something developed into a deeper desire to experiment and explore. They become obsessed with anything incredible, unbelievable, and phenomenal. This momi then smiles. The Mind Museum‘s traveling exhibition Science Circus is in town. And I will bring the boys there soonest as it will be for a limited run only. From October 28, 2016 to January 31, 2017, the exhibition will showcase anything amusing, peculiar, and extraordinary. I imagine the tricks are the deceive-the-senses and boggle-the-mind types. Truly, a perfect show for my boys and for those who are easily startled by anything beyond explanation. More than the death-defying daredevil stunts which the usual circus promotes, the Science Circus focuses on the mind’s “acrobatic” perceptual tricks. A festive and colorful facade await guests to truly set the tone for the sights and sounds of something spectacular. There will be three adjacent rings displayed simultaneously. Guests can go in any of the Rings in the order they please. Ring Two highlights Pieces of Incredible Engineering. The exhibit engages the mind in puzzles and relishes how math and art come together. This central area is animated by a simple machine and engages guests in activities that evoke their inner engineer. Ring Three is Encounters with the Masters. Guests can interact with and learn the secrets of the Masters of Illusion. They can take on the challenges posed by each Master. And they get to discover how the brain can be trapped by smoke and mirrors. The Science Circus: Step Right Up! exhibition vividly illustrates how our everyday experiences are full of delightful secrets that we can uncover. That there are more to discover about ourselves and the world around us. Surely a show my boys would love to see again and again. I tell you, they are easily fascinated by any perceptual illusions that trick the brain. The Mind Museum’s Science Circus is in Town! Wow! This sounds like so much fun for the kiddos. Looks like a great outing for the kids!! My nephews also love all things science related! This looks like super fun! I love museums and I think I will love staying in the Science Circus. My son would love to go there. He loves museums and science, it is the right place for him. Good times. My son would have a blast here. Nice post. This would be a lot of fun for kids! My nieces would love this! I wish they had something like this near us.